Afra, the divine patron of Africa, exemplifies universal brother/sisterhood and embodies the flame of freedom. In this book, he reveals how to connect fully to the light and fabric of our souls. 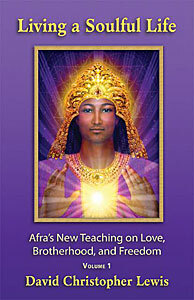 Master Afra, whose name means “brother,” models the essence of soulfulness, kindness, and brotherly love. His stories, revelations, and insights—from past civilizations through modern times—show us how to reconnect with the Divine for personal and planetary unity and enlightenment. Read this book to quicken an awakening of your soul—and experience harmony, peace, and freedom in your life in new and powerful ways!